This issue of Worlds of IF, Science Fiction, commonly just referred to as IF Magazine has a peculiar cover. The white space almost makes this look like a reprint of some kind, however, it isn't. This is how they chose to deliver this one issue. Most issues during the 60's have a simple white band across the top, with full width art. I haven't been able to find any explanation as to why this cover has peculiar use of the white space. 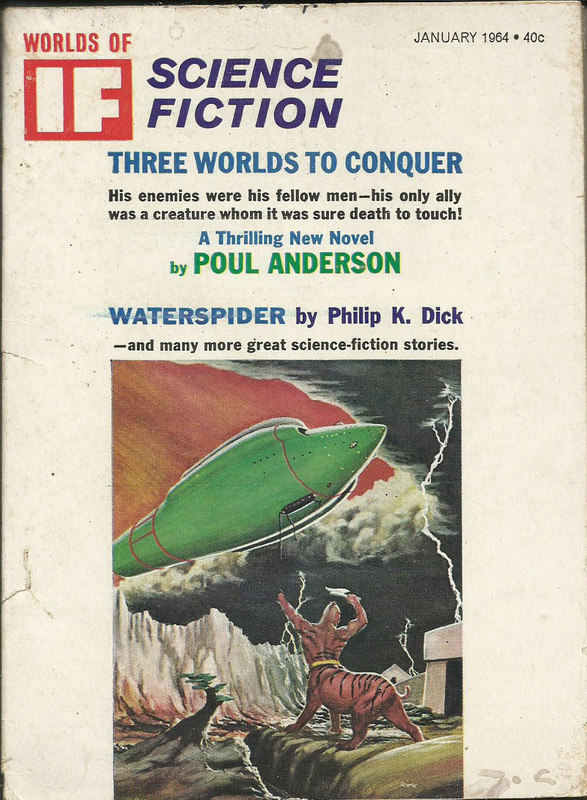 Here is an image of a typical cover from the 60's for comparison. IF Magazine has a tendency to list only the last name of their illustrators. This can cause quite a bit of confusion if you're researching. For example, the cover for this issue is simply labelled as McKenna. As it turns out, that is Richard McKenna. That same year another Richard McKenna, the author Richard (M) McKenna, illustrated one of his own stories: When the Stars Answer, in another publication. This is confusing! Virgil Finlay is an easy one to sort out, but what about Nodel? Is that Norman Nodel the comic book artist? I don't see this publication listed anywhere in his works, and I did manage to find one of his signatures somewhere and it doesn't quite match up to the ones in the illustrations below. Then again, that N does look quite similar. I have no idea. Welcome to Sci-Fi Sundays! I'm in my mid 30s and grew up steeped in science fiction. From as far back as I can remember, the books on my family bookshelf bore the names of Isaac Asimov, Ray Bradbury, Arthur C. Clarke, H.G Wells, and the like. The books seemed, to my immature eyes, like such odd and frustrating things. They had these enticing and rich illustrations on their covers, but inside, mostly only walls of text that I wouldn't learn to appreciate till my age hit double digits. Occasionally I'd stumble upon something like Analog, and be delighted to find illustrations inside, sparse as they may be. 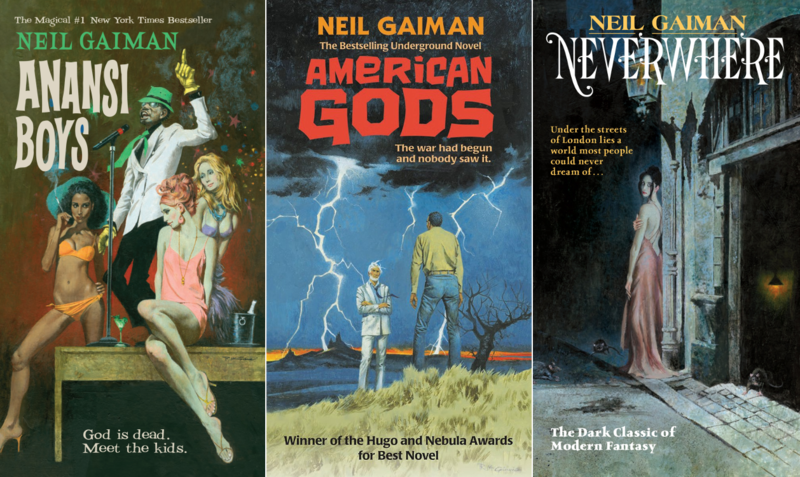 Something about this experience left a permanent mark on me, and the illustrations of science fiction pulp has always seemed somewhat magical. It isn't usually the highest quality art work, but it was always something new and interesting, either some imaginary creature or piece of machinery. 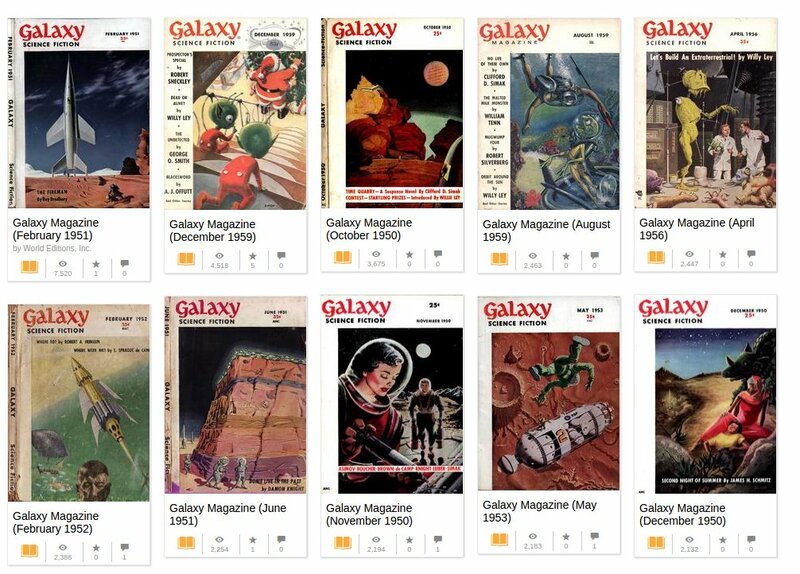 A reader writes, "An original interview with Robert Silverberg on the subject of his early work as a pulp writer and editor for Amazing magazine. Posted yesterday, for Poulpe Pulps: A Silly Website, which features pictures of the octopus in pulp art. Silverberg: what an elegant and gracious writer!" RS: Back in my pulp-mag days I worked from about 8:30 to noon, took an hour off for lunch, and worked again from one to three, for a work day of five and a half hours or so. I wrote 20 to 30 pages of copy in that time, doing it all first draft, so that I was able to produce a short story of 5000-7500 words in a single day. If I had 3000-worders to do, I usually wrote one before lunch and one after lunch. At three o'clock I poured myself a shot of rum or mixed a martini, put a record on, and sat down to relax until dinnertime, reading and perhaps sketching out the next day's work on a scrap of paper. This was the Tuesday-to-Friday routine. I never worked on Saturday or Sunday. In weeks when I was writing a novel, I followed a five-day schedule, doing about thirty pages a day, so a typical Ace novel would take me six or seven days to write. Steve sends us "The premiere episode of Electro-Pulp Video Magazine, a visual history of pulp science fiction magazines. 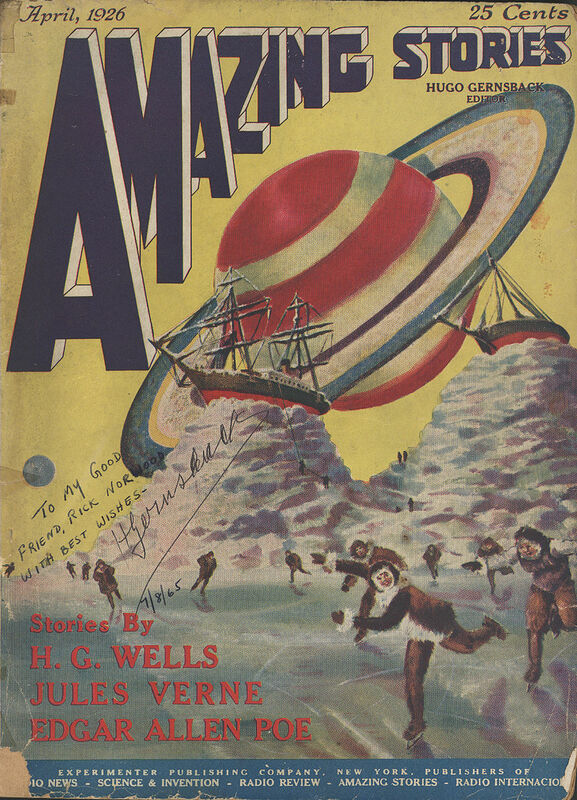 The premiere episode covers the inaugural issue of Startling Stories from January, 1939. 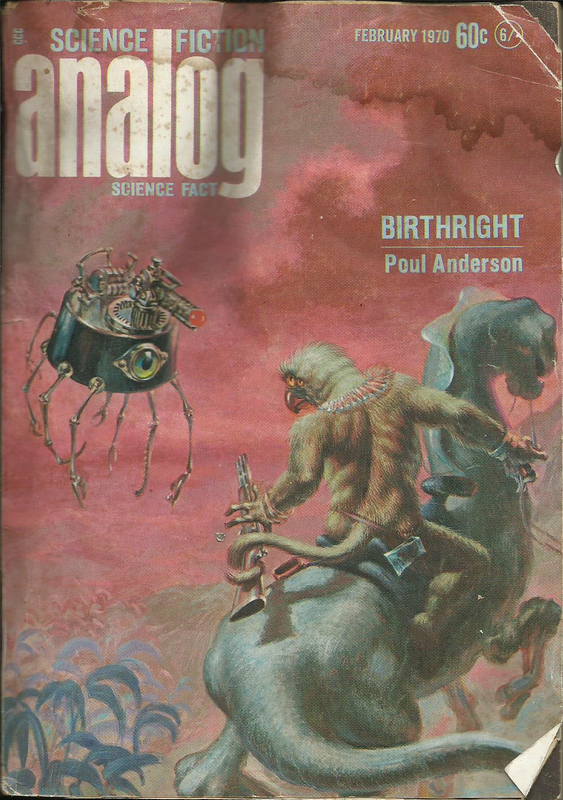 Features Stanley G. Weinbaum's novel The Black Plague, a short story by Eando Binder, the first ever SF story to be inducted into the Scientifiction Hall of Fame (D D Sharp's The Eternal Man), an editorial by Otis Adelbert Kline and a letter column featuring Isaac Asimov." Startling Stories on the Premiere of Electro-Pulp Video Magazine!